The Coastal Range in southwestern British Columbia is a land of spectacular mountains, and home to the southernmost icefields in North America. 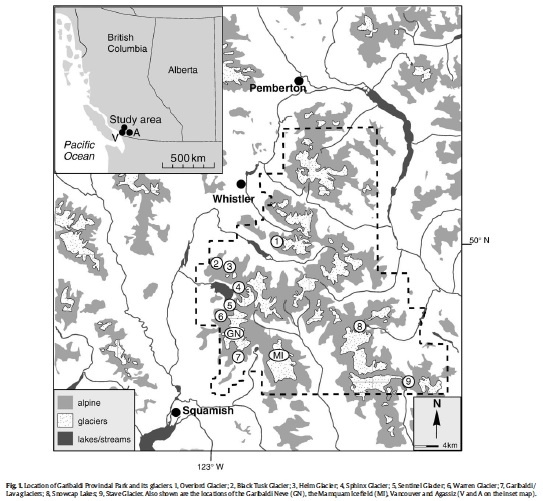 The rapid rise of the mountains from the inland passage between Vancouver and Victoria Island, along with prevailing winds bringing marine moisture from the Pacific means that there is ideal conditions to foster alpine glaciers. 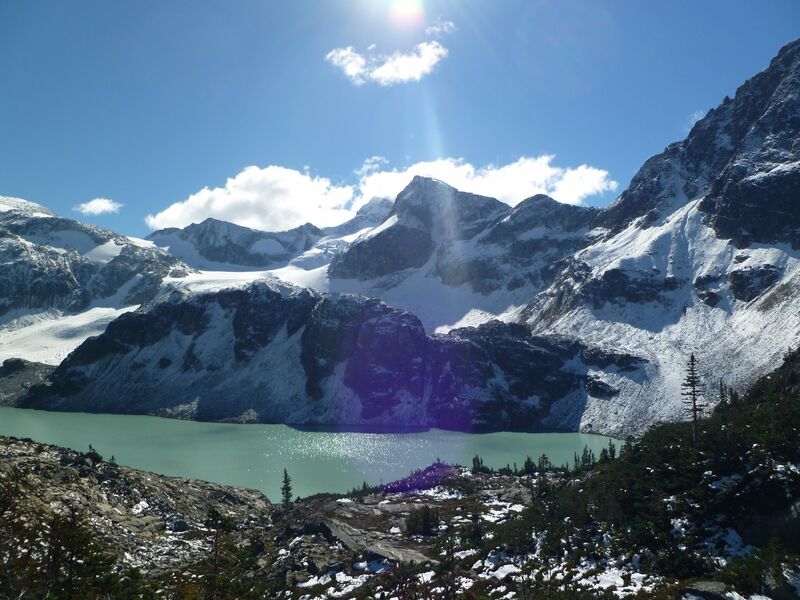 We visited Whistler (of 2010 Winter Olympics’ fame) with the hope of visiting some of the glaciers before they disappear — yes, although there are many alpine glaciers, they are in rapid retreat probably due to increasing atmospheric temperatures. To be sure, ice is every where, but a simple comparison of photographs from the early part of the 20th century to the scenes today shows that the ice is disappearing. Whistler is located in a broad mountainous zone, known as the Coast Range, which extends from Southwestern Yukon along the entire coast of British Columbia (1600 km long, average 300 km in width). There are numerous subdivision of the Coast Range, and the southern most extreme is called the Garibaldi Ranges. Whistler sits in the middle of the Garibaldi Ranges, and the high point is Wedge Mountain (elevation 2892 m) which is just north of Whistler. The geology of the Garibaldi is complex, and it has taken geologists decades to unravel the imprints of ancient subduction, plate fragment accumulation, and volcanism to develop the history of these mountains. 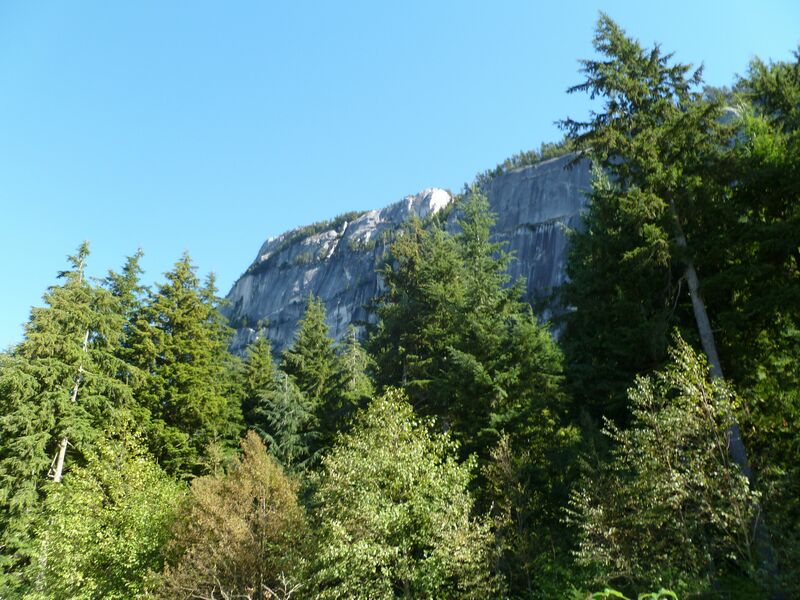 The Coast Range was built in response to the complex interactions between the North American Plate and various smaller plates, most of which have now disappeared. About 130 million years before the present an oceanic plate named the Insular Plate was subducting beneath North America – along the western margin of the Insular Plate another oceanic plate was subducting beneath Insular called the Farallon Plate. Farallon-Insular subduction zone built a volcanic island arc on the Insular plate (the modern day analog to Farallon-Insular-North America is the Phillippine Mobile Belt). The relative plate motions between these three plates meant that the Insular Plate was doomed to demise – the relative motion of North America was to the west, and Farallon to the east, shrinking and squeezing Insular until it ceased to exist 115 million years before present. The Insular Island arc was “accreted” to the North America Plate forming the Insular Belt of folded and metamorphosed rocks “glued” to North America by a large granitic batholith. Once the Insular plate disappeared the Farallon was now subducting beneath North America, and a Continental arc (not unlike the coast of Washington and Oregon today) formed and was populated with large stratavolcanoes. The mountainous zone associated with the arc was known as the Coast Range Arc, and was active from approximately 100-85 mybp. About 85 mya the Farallon plate broke into fragments, and the northern section which was subducting beneath modern day BC became the Kula Plate. For the next 30 million years there was a massive influx of granites and formed one of the largest granitic bodies in North America and are now exposed in the Coast Ranges. The Kula plate eventually developed a relative motion that shut down the subduction beneath BC, and began subducting beneath southwestern Yukon and Alaska by 50 mybp. 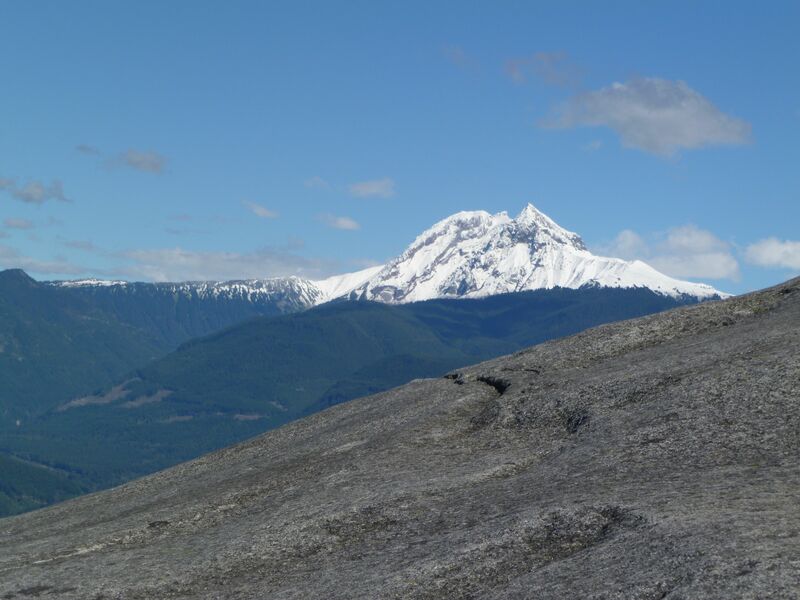 This shut down most of the volcanism within the Coast Ranges, although some stratavolcanoes like Mount Garibaldi remained active until more recent times. Glaciers are defined as bodies of persistent ice with surface areas exceeding about ½ of a square km. In general glaciers grow and shrink, and this is promoted by the flow of ice; snow falls on part of the glacier and is compressed into crystalline ice which creates a gravitational stress “forcing” the surrounding ice to flow downhill. The ice at the leading edge of the flow eventually melts, either through encountering higher ambient temperatures in the atmosphere or the warm (above freezing) waters of the ocean. A special category of glaciers are called Alpine Glaciers, which form near the crest of Mountains, and are feed by the seasonal fall of snow and melting at the lower reaches to the mountain, particularly in the summer. The area that a alpine glacier adds ices is called the neve, and typically is a bowl shaped region which is called a cirque. Glacier motion is controlled by two things: the strength of the ice, and the stress applied to the ice. The crystal structure of all ice occurring in the natural environment is hexagonal – all snow and ice on Earth forms in a six-fold symmetry that typically forms sheets lying on top of one and another. The figure below shows a typical arrangement of these sheets; the red ball-and-stick figures are the oxygen atoms and the bonds to the 2 hydrogens in a water molecule. The bonding between the sheets is weak, and under horizontal stress the sheets “slide” past one and another. For small bodies of ice the stress loads introduce by gravity are modest and the ice deforms mostly as an elastic material. However, when ice exceeds a thickness of about 100 feet it begins to deform plastically, meaning that it flows. The flow is characterized by the Glen-Nye law that relates flow (strain rate) to stress (the weight of the ice) and temperature. The flow of ice in a glacier is typically lowest along the base because of frictional resistance with the underlying rock. Occasionally, glaciers also move by a process known as basal sliding where the glacier is lubricated by melt water (and making the frictional resistance disappear). The fate of a glacier is controlled by mass balance; ice is added to the top of an alpine glacier and ice is removed by melting at the toe or sublimation to the atmosphere (the removal of ice is called ablation). There are many factors that can upset the mass balance, including temperature, rate of precipitation, and sudden movement that breaks apart the glacier. The temperature effect appears obvious – if the glacier interacts with a warmer atmosphere less ice is formed. However, this is actually a complex interaction and sunlight subliming the ice can increase during cool but clear conditions. The precipitation is more straightforward; no moisture, no ice formation. 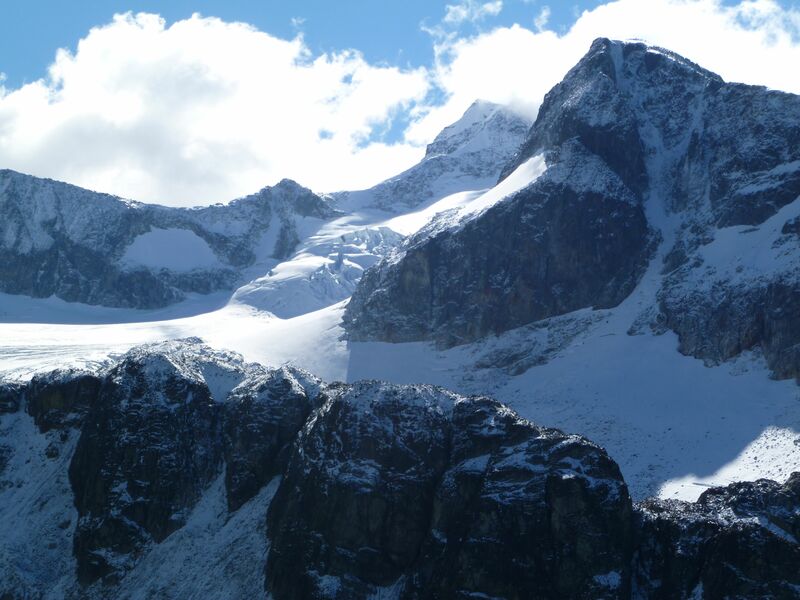 All glaciers in the mountains of British Columbia are in retreat, meaning that the toe of the glacier is melting faster than new ice is arriving from the neve. This phenomena is of alpine glacier retreat is well documented globally for mid-latitudes. There are fairly good observational records for the shape of glaciers for many areas stretching back a couple of hundred years. Francois Matthes noted that global temperatures where abnormally cool from about 1350 to 1850, and he called this the Little Ice Age (LIA). Most early observations of alpine glaciers occurred during the LIA; after 1850 when the global temperatures increased there was widespread glacial retreat. Around 1930 this retreat slowed, and for many regions glaciers actually grew until about 1980. Since 1980 glacial retreat has become universal, and appears to correlate with the global mean temperature rise. 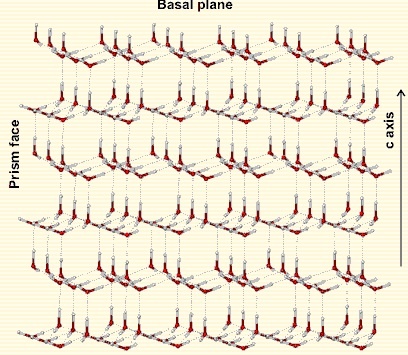 The picture above from Koch et al. 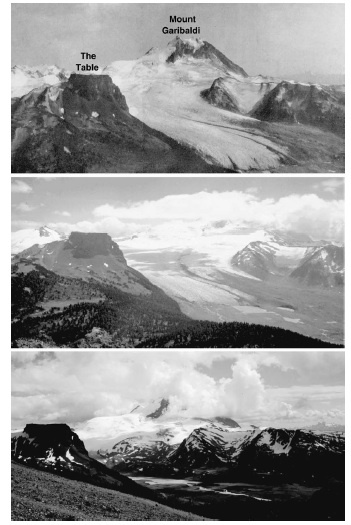 (2009) shows the Warren Glacier (which is located within the Garibaldi Ranges) photographed three different times. This glacier was in retreat with the end of the little ice age (comparing 1912 to 1929), but was episodic in growth/retreat until 1977. Since that time the Warren Glacier has been in rapid retreat. Over that last 20 years it has retreated at and average rate of 20 m/yr. Not all glaciers in the Garibaldi are retreating at the same dramatic rate, but all are retreating and thinning. A linear projection (which is always a bad idea, but simple to do!) 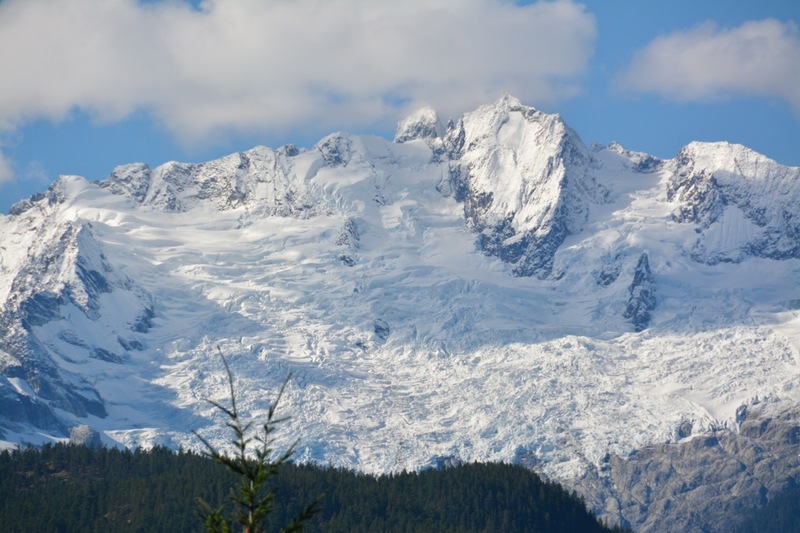 suggests that 90 percent of the Garibaldi Ranges glaciers will disappear by 2035. Alpine glaciers are a truly beautiful feature of high mountains. The ice also strongly shapes and carves the bedrock leaving both sharp and rounded structures that define the peaks. It is rather remarkable that ice could have such at profound erosional signature considering the softness of ice. However, like sandpaper glued with tiny corundum fragments, glacial ice lifts loose rock and freezes the into place along the base of the glacier. As the glacier moves downhill the rock fragments cause abrasion and “polish” the underlying bedrock. The abrasion produces “rock flour” that eventually flows away in the glacial melt. The rock flour is what causes glacial melt water to be various shades of milky green. All of these glacial process, along with the ice, are most likely to be gone before 2050. This will mean that we have different mountains, different vistas, and different impacts. The nature of global warming is such that the die is cast — nothing is going to reverse the temperature increases in the next 100 year. This means that it is imperative to visit these nobel mountain architects now, and appreciate their geologic legacy.